DynoTune Product, 713.3-DynoTune Nitrous Lean Shutdown Switch AFR - DynoTune, Nitrous systems, Purge kits, Nitrous Bottle heaters and more! This device will monitor your existing wideband 0-5v output and display the voltage. You set the trip point voltage. When at WOT the lean switch will then start to monitor the AFR and if it goes lean during the run it will shut your nitrous down. simple to install and setup. We have been selling this device for 18 plus years, this is the newest version. 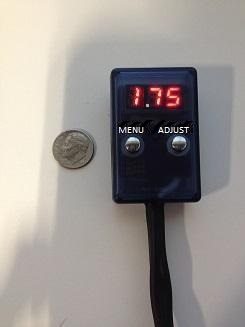 �+12V output and a ground output when the nitrous is active. Use one to power your nitrous relay and the other can be used to activate a retard device. �works with all 0-5V wideband outputs and all nitrous systems! �Simple to prgoram via on board menu with buttons, no computer needed.